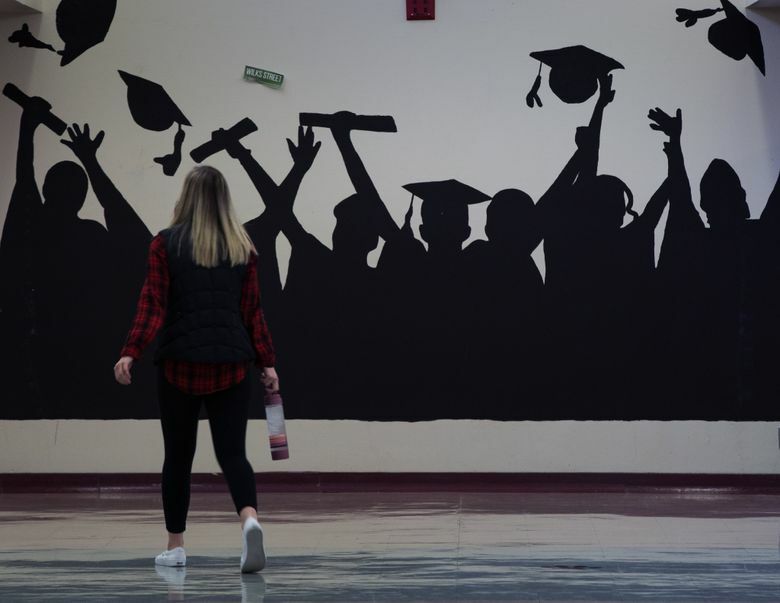 A student walks down a hallway decorated with a graduation silhouette at W.F. West High School. The Chehalis School District is revamping its culture in an effort to get more kids to go to college. With the help of a foundation and philanthropists who grew up there, it’s partnering with the local community college, Centralia College, to get more students to attend and finish higher education. The philanthropists behind it think it could be a model for the state. In Washington state, only about a third of students ever earn a bachelor’s degree. In rural counties, it’s even lower. But in Chehalis, a Lewis County town in the southwest part of the state, educators are trying to build college fever. 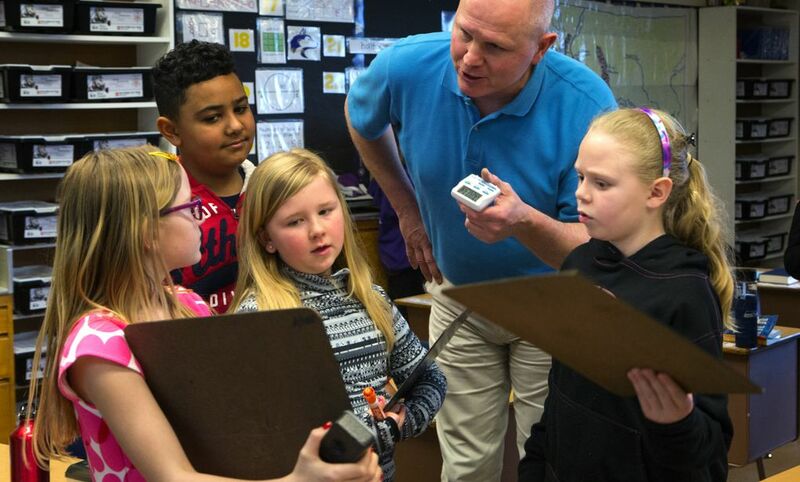 On a recent Wednesday in Chehalis, where people once made their living mining coal and felling timber, Principal Bob Hunt paced across his front office and told a story he hoped would inspire his 400 elementary-school students to think about college. With his singsong voice echoing through the school’s P.A. system, Hunt talked about Jody Bradley, a first-grade teacher who had grown up in Chehalis and, at first, hadn’t considered higher education. Bradley worked at Burger King after graduating from high school, he said, then at a toy store, before she decided to go to college so she could become a teacher. Lewis County, the southwest Washington county where Chehalis is located, has one of the lowest college-going rates in the state. It’s symptomatic of a big disconnect in Washington state — where there’s a boom in high-paying, mostly high-tech jobs, yet two-thirds of students don’t earn the two- or four-year degrees they need to apply for them. Statewide, just 26 percent of the high-school graduating class of 2007 had earned a bachelor’s degree six years after graduation, well below the national rate for even rural schools, which is 32 percent. In rural and semirural parts of Washington (including Chehalis), the rate is even lower. 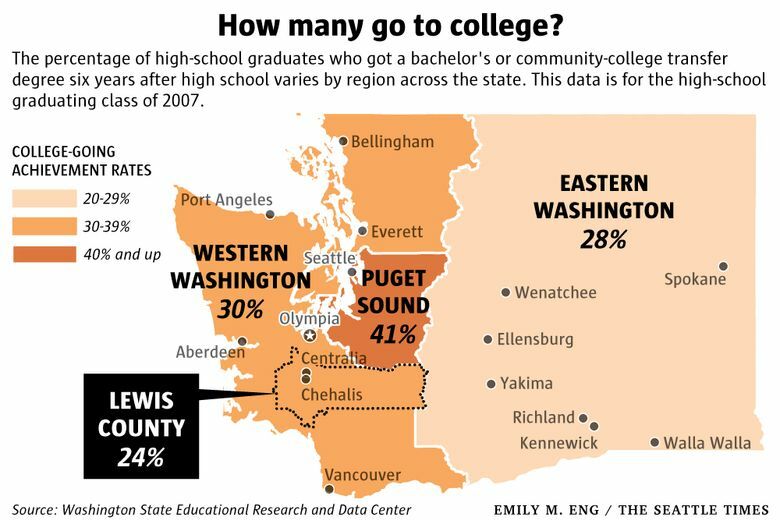 Only about 15 percent of adults in Lewis County have a bachelor’s degree, the third- lowest of any county in Washington. That was just fine a generation ago, before the coal mine shut down and the timber industry contracted. But mining, logging and construction now account for less than 10 percent of all Lewis County jobs. Now, almost all of the jobs that pay well require at least some college-level training. Until recently, Chehalis School District staff didn’t realize that only 20 percent of their students went on to earn a four-year degree. That wake-up call came when the district commissioned a study, paid by the district’s foundation. The surprisingly low figures shocked district officials into a slew of changes. That included talking frequently to students about the importance of college, as well as fundamental fixes in how teachers teach. The district also has joined forces with the region’s community college to help make sure Chehalis students who go there finish their degrees. 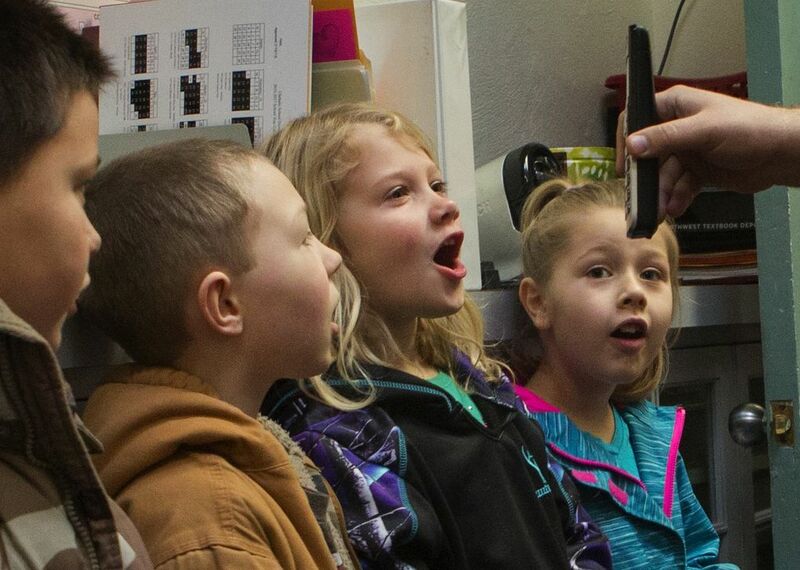 The early results are promising, and some Chehalis officials believe that the district can become a model for other Washington school districts — especially in rural areas — so that native Washingtonians don’t miss out on the best jobs here. It’s almost impossible to overstate how difficult it is to finish a college degree for a student whose parents didn’t attend, whose school doesn’t make it a priority, and who has come to believe only rich kids go to college. On paper, for example, Andrew Ulrich looked like a prime college football recruit when he graduated from Chehalis’ W.F. West High in 2007 — seven years before the changes started at Chehalis schools. At 6-foot-8 and 290 pounds, Ulrich was a standout on the high-school football team, and Division I college recruiters were watching him. But Ulrich didn’t know the first thing about how to prepare for college. His GPA was low. He didn’t realize there was a difference between the state-required standardized test (then known as the WASL), and the tests that students take to be considered for college admission, such as the SAT. He knew of no college recruiters visiting W.F. West, although military recruiters always came. He’d grown up believing the words of his father, a mechanic — words that described college kids as snobby, overeducated, rich. And there was no money for college anyway. Ulrich was the fourth of six children in a family that made ends meet by growing vegetables in the summer, chopping wood to heat the home in the winter and shopping for clothes at a secondhand store. This is the first of two Education Lab stories exploring efforts to prepare more Washington high-schoolers for the good jobs being created here. Today: How Chehalis is pulling out the stops to get more students into college or career training. Monday: Why every student in the tiny town of Onalaska was accepted to college this year. So after high school, he worked for his father for a few years, got married and then did a variety of jobs around Lewis County. It’s now been 10 years since Ulrich graduated, and Chehalis looks and feels like a different district. In the schools, every teacher’s door is decorated with the name of his or her alma mater. The high school devotes 25 minutes a day for seniors to explore careers, work on college planning, meet with advisers and set goals. 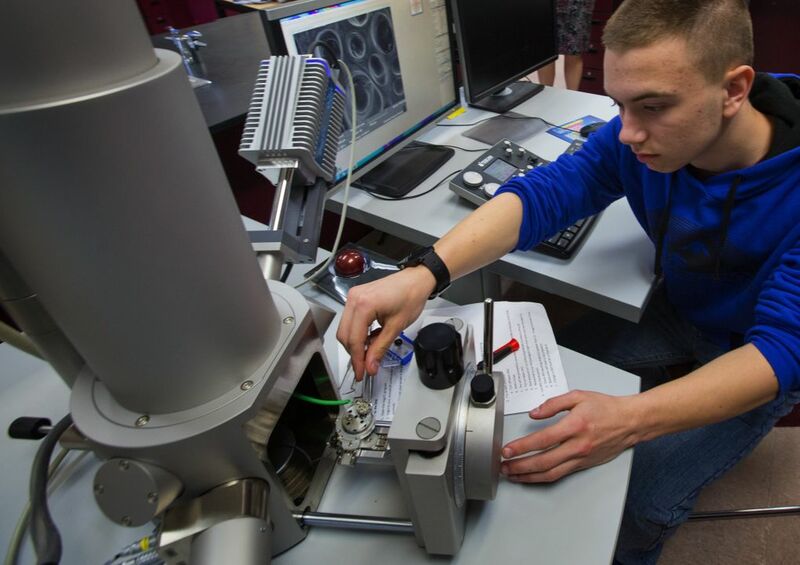 To seed students’ interests in the hot fields of science and engineering, the district has purchased equipment more commonly found in colleges, including an electron scanning microscope that, at $175,000, costs about as much as a small Centralia house. And it spent three years retraining all of its teachers on how to add rigor to their lessons and get students to explain their reasoning behind an answer, show them how to find alternative ways to solve a problem and work together in pairs or teams. At first, the foundation wanted to fund college scholarships. But its members asked a simple question: Is that the best use of the money? They looked at one of the longest-running efforts to boost college-going through scholarships, the Michigan’s Kalamazoo Promise program. But Kalamazoo has found that tuition help only goes so far: Students need better academic support if they’re going to be successful in college. 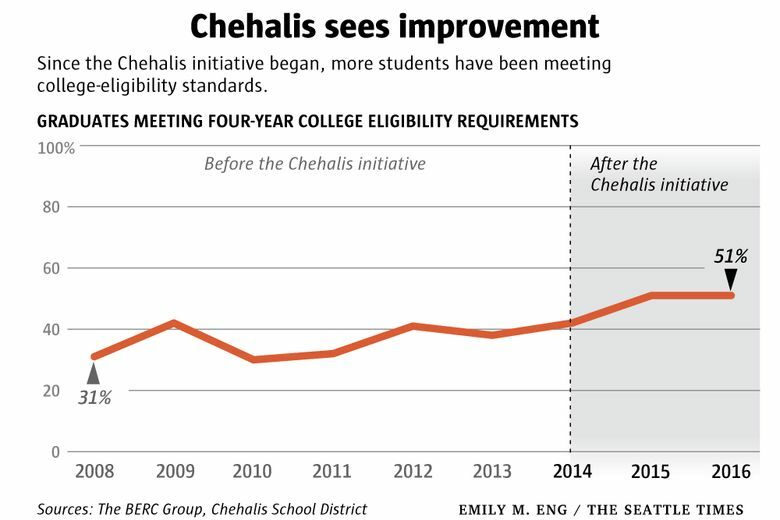 So the Chehalis Foundation helped the district hire a consultant, the Bothell-based BERC Group, to help figure out how to get the most bang for its buck. BERC did a far-reaching analysis of how the district was preparing students for college. Among its discoveries: Only 38 percent of high-schoolers were taking the classes they needed to apply to most four-year colleges. Only 38 percent of Chehalis grads were finishing a degree six years after high school. And only 20 percent were getting a bachelor’s degree. That was in sharp contrast to what the district had always assumed, admitted Superintendent Ed Rothlin. Its pride in its college-preparation efforts unraveled. In dissecting how Chehalis teachers did their work, BERC also found that many employed a top-down style, telling students what they were going to be doing that day and then instructing them how to do it. So far, that has been the most challenging pattern to change. Over three years, the district has done districtwide training, given all of its teachers opportunities to observe one another in the classroom, and provided them with time to reflect on what is working, and what is not. Fourth-grade math teacher Scott Ashmore at Olympic Elementary in Chehalis checks on his students’ discussion during a class project. Students from left: Kallie Hitch, Ashaun Wheaton, Peyton Gibbs and Deseree Abrams. The Chehalis School District is remaking its public school system to try to get more kids to go to college. Not all Chehalis parents immediately embraced the changes the district proposed. Though district leaders could show that college led to the better jobs, some parents still viewed a college degree as a waste of money. As Lewis County’s timber and mining industries have shrunk or disappeared, “the culture hasn’t necessarily shifted,” said Liisa Preslan, the Centralia College director of a federal program that helps first-generation students go to college. “There’s a lot of misunderstanding about college and what it means, what it costs,” Preslan said. In talking to parents, the district made sure to underscore that it was also talking about two-year degrees and job training — not just getting a degree from a four-year school. It also formed a strong partnership with Centralia College, a state community college, because that’s where half of all W.F. West High graduates go, if they go to college at all. The foundation pays for extra counseling help in that college, as well as in middle and high school. 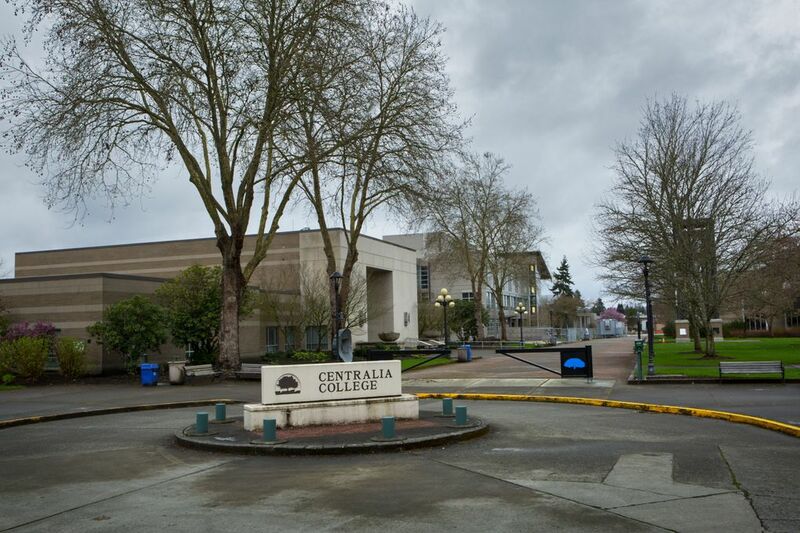 At Centralia College, for example, it pays half the salary of assistant professor and counselor Lisa Wilson, who personally watches over the 80-plus Chehalis graduates. Wilson visits W.F. West often, building relationships. When West grads arrive at the college, she gets them together for social events throughout the year. Last year, students formed a pep band — a notable step, because many community college students never make the kind of strong bond with their colleges that four-year-college students do. At the end of every quarter, Wilson looks for signs that students may be on the verge of dropping out. This past quarter, one was Yulisa Gomez-Reyes, a 2016 grad who wants to be a physical therapist. Gomez-Reyes planned to get an associate degree at Centralia, then transfer to Eastern Washington University. She would be the first in her family to earn a college degree. But this spring, Gomez-Reyes was falling perilously close to a 2.0 GPA, and if she hit that number, her financial aid would be canceled unless she appealed. Wilson knew that the automatically generated letters warning about a financial-aid cutoff cause many students to drop out, so she called Gomez-Reyes into her office to help her strategize. She saw that Gomez-Reyes was pursuing an associate in science degree, but was having the most difficulty in science classes. She suggested another path: Gomez-Reyes could get an associate in arts degree, and still transfer to Eastern. Gomez-Reyes made the switch and, also on Wilson’s advice, wrote an appeal on her financial aid. At W.F. West High, college-prep adviser Kerri Chaput, who’s also partly paid by the foundation, invites recent grads to talk about what college is like. Every month, career specialists also give tips on how to get into specific fields — or win apprenticeships. Last summer, with financial help from the foundation, 34 juniors got a taste of college through free classes at Centralia. The students still have their regular high-school counselors, too, but Chaput has a special, college-focused mission. “I follow them around and remind them, ‘Your scholarship is due,’ ” she said. And it’s not as easy as it may sound. Just six miles away, in Centralia, counselors struggle to get students to fill out financial-aid forms, even when they qualify for a state scholarship that would give them four years of free college tuition. All the changes in Chehalis started just in 2014. Yet in the three years since, the number of eighth-graders taking algebra has doubled. High-school students are taking harder, college-prep-level classes. And there’s been an 8 percentage-point increase in kids going directly to college after graduation. The goal is to go from 20 percent of students earning a bachelor’s degree to 60 percent by 2024. That’s an ambitious goal, but one that Chehalis educators think is necessary for Lewis County — and Washington state — to catch up to the demands of the 21st century. They hope the changes they’ve put in place will not just help the kids, but also the county, by drawing more and higher-paying jobs to an area where the unemployment rate, at 8 percent, is one of the highest in the state. It’s not the only district in the county working to make changes: so is tiny, nearby Onalaska, for example. But no other district has done as much. 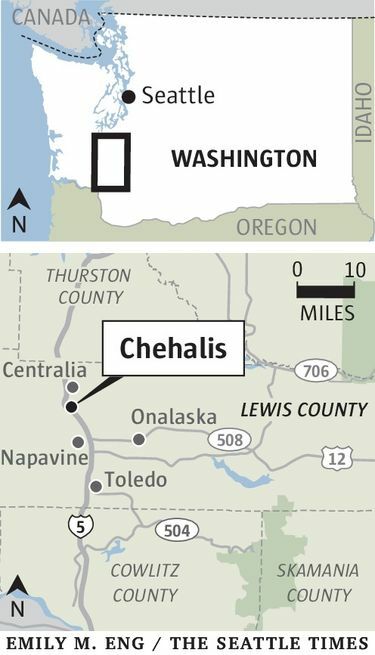 And while some nearby districts are vexed that Chehalis, which is economically better off than many of its neighbors, is benefiting from its foundation’s largesse, business and school leaders hope it can be a model. If the effort works, it could be an example of how to turn around a school district without some of the drastic measures that have been promoted in recent years, especially under the Bush Administration’s No Child Left Behind Act. “This whole thing is occurring within this public school system,” said J. Vander Stoep, an attorney and Chehalis Foundation member who served in the state Legislature for three terms in the 1980s. In his mid-20s, Ulrich — the football player who graduated before all the changes began — realized he’d never get far without a college education. Four years ago, he started at Central Washington University as a 24-year-old freshman. He’ll graduate June 10 with a bachelor’s degree in occupational safety and health management, and with a spot on the college honor roll; he expects to earn a 4.0 in his last quarter of college. And he has a good job lined up after graduation: working for the international construction firm Kiewit as a safety manager on projects in Colorado. Ulrich wishes Chehalis had done something to direct him toward college, but he’s also proud of the way the district is transforming itself. Recently, his first-grade nephew Max took a photo of Ulrich to class for show-and-tell: His Uncle Andrew, the football player and college graduate. “It’s awesome to give them something to strive for,” he said.